Over time, our computers have gotten smaller and more portable and this phenomenon, coupled with fast internet speeds, has allowed us to work on-the-go. For those who prefer this freedom, Google Docs is surely among the most reliable products. Besides letting us take all our work online, Google Docs – as well as Sheets and Slides – also allows multiple users to collaborate and work together. It has inspired the inception of many other services which add on to the rich suite of features or focus on certain elements to ensure that your productivity is unhampered. So if you’ve been looking for some of the best Google Docs alternatives, we’ve listed them out our best picks for you below. While Google Docs does not lag behind other apps offering similar functionality, it definitely makes sense for us to take a look at some of its best alternative. Moreover, a lot of these apps are focussed on collaboration which is better than playing ping-pong with emails for minor changes. So, here’s our list of the top Google Docs alternatives that we think you must take a look at. If we step down from Google docs, Office Online definitely deserves the first mention. It is Microsoft’s answer to Google Docs and it provides all the basic to average features of Google docs. The only difference comes at advanced features. They both offer some unique advanced feature to each other, so the competition stays at advanced level. For example, Google offers drawings tool in its office suite, but Office Online offers OneNote with a complete note taking app. Microsoft Office Online also comes with “Tell Me” feature that will let you ask the Office online itself if you get stuck and want to know how to do something. The feature is amazing all you need to do is type what you want to do and you will start seeing answers (quite precise as well). Now the question holds, why you should move to Office Online from Google docs? Well, both are quite strong right now, and deciding what you should use completely depends on your needs. If you are a Microsoft Office (the Desktop app) user, then you will find Office Online to be very similar, making it easy to adapt to. All your documents are saved in Microsoft OneDrive, just like Google docs saves documents in Google Drive. Furthermore, if you are a big fan of Microsoft Office Suite, but didn’t wanted to pay for the expensive suite. Office Online can be considered as a completely free alternative to it, as it offers almost same features with a bit limited advanced features of Microsoft Office Suite. It should be noted however, that Office online will only work with an internet connection, unlike Google docs that let you edit offline as well. Unlike other Online Office suits, Quip doesn’t offer all the advanced document editing features. However, if you are looking for a free tool that offers some robust collaboration features on all your devices, then Quip is the answer. Its interface is very intuitive and collaborative on all devices like smartphones, tablets and PC, unlike others that work best on a PC. All documents come with a chat section where you can easily discuss about the document. This is especially handy on Smartphones, making it simple to chat and interact with both document and the chat. You can easily edit documents both online and offline and discuss the topic (online) on the go. It also has a news feed feature that lists all the changes to the documents, so you could keep up with the changes. Few things that even Google documents lacks. However, the editing features it offers will not help you create some complex documents like manuals, etc. It offers basic formatting and writing features and will let you insert pictures and tables at max. Although, these tools should be good enough for writing some quick posts, articles and any document that doesn’t require much formatting. The main reason why you may want to try out Quip is for its vast collaboration power and ability to easily sync across all devices. If you don’t have to write complex documents and want to make sure you get the best interface for collaborating with your colleagues on the go, then Quip is the answer. ONLYOFFICE is another great substitute for Google Docs. It offers all the average editing and collaborating tools Google Docs has to offer with an interface similar to Office Online. It comes with a Paid version with a free 30 day trial targeted towards small to medium businesses and a free online office suite for personal use only. This list is for Google Docs alternatives, so we are only going to review the free version that can replace Google Docs. The free version is only for personal use, if you are a big company then you will have to opt for paid version that includes all the tools required by a company, such as mail servers, domain and CRM tools. With ONLYOFFICE you can create Documents, Spreadsheets and Presentations. You can add comments to a document and also live chat right on the document. This helps you remain focused and prevents you from changing between different apps while working on a document, just like in Quip. The best part is that, you can attach a cloud storage account with ONLYOFFICE to save your work at one place. You can connect Google Drive, DropBox, OneDrive, Box and OwnCloud. Right from the main interface, you can download, move, delete and share documents, making it very easy to interact with documents. You should go for it, for the superior collaboration it offers and the ability to add different cloud storage accounts. 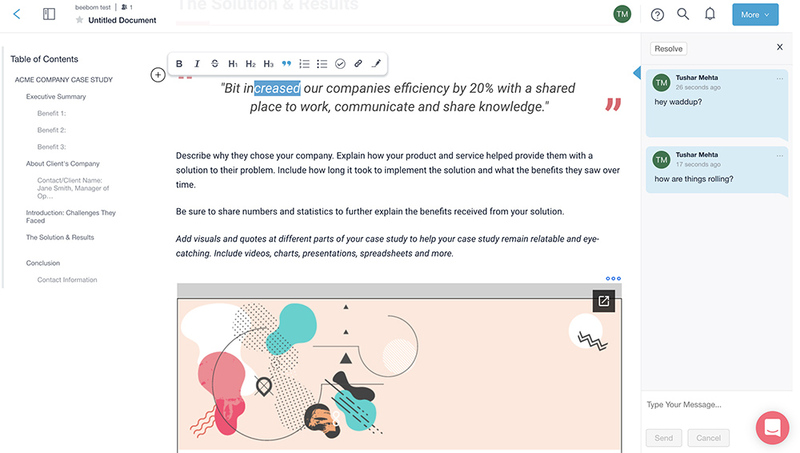 It is more of a beefed up version of Quip on PC, you get all the standard editing tools of Google Docs and collaboration ability of Quip in one place. However, it is only available for Windows and Linux. Paper is among the simplest collaborative editing tools capable of being counted as great Google Docs alternatives. It is the successor to Hackpad which was also by Dropbox, but with the additional ability to add spreadsheets, pictures, and links to Dropbox files. You can also directly tag other Dropbox users that might be in your contacts list or add your Google account to be able to invite them to collaborate with you. Apart from tables, media, and Dropbox files, you can also add comments to the Paper document, and even To-do lists, calendar timelines, and blocks of code. You don’t get many preset customization options or templates like the previous two services but the simple-to-use – and more importantly, free – interface can compel you to choose Paper over other Google Docs alternatives listed here. Compared to Google Docs, Paper is more focused on interactions and comments. Furthermore, you can dynamically add a lot of elements to the document itself without having to rely on other services. So if you just want to make notes or plans and share it the team, Paper is possibly one of the best and the lightest options. The editing options are limited and if you’re looking to heavily edit your docs, then Paper might not be the appropriate choice. But if you’re running a small company or a business and want to improve your workflow, Paper will be an excellent option and one of the best Google Docs alternatives for collaborative creative work. Zoho is actually a big software company that creates softwares that cater to needs of businesses. It has quite good reputation with over 2500 employees and has a robust list of business oriented softwares, with software for almost every business need. Zoho Docs is one of them offering ability to create, documents, spreadsheets and presentations. 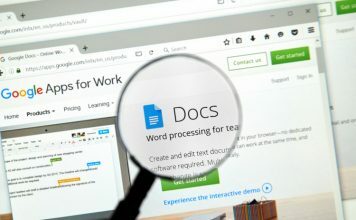 Zoho Docs offers features similar to Office Online, but still it is unique enough to ditch both Google Docs and Office Online. To start with, it comes with both desktop and web based apps which you can use for both online and offline access. Everything edited on any of the platforms will be automatically synced. Best of all, Zoho Docs creates a separate folder in your PC and every document added there will be synced with Zoho, that includes documents from other sources as well. Collaborations tools are similar to Google Docs, so there isn’t much we can say. Why you should go for Zoho? 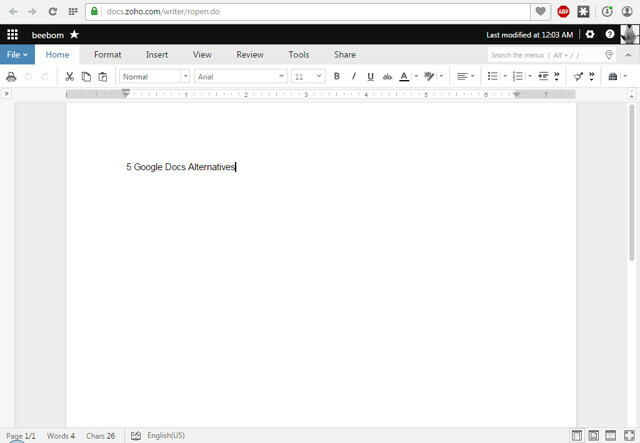 The reason is simple, if you like Office Online over Google Docs then you might want to checkout Zoho first. It has almost all the features Office Online has to offer, even a similar “Tell me” feature named “Search the menus”. However, it offers offline working capability and a separate desktop app, making it a better choice than Office Online. CryptPad is a set of easy-to-use online applications which you can use as a replacement of Google Docs. You can use popular formats including rich text documents and presentations. Besides these two formats, users can share polls, Trello-style whiteboards, to-do lists, and even a code compiler window. Besides this wide range of options, CryptPad can be seen as one of the preferred Google Docs alternatives for one simple reason and that is because you don’t need to sign up in order to create an online document (however, it will be needed if you want to allow others to view the contents of the documents). You get a good collection of editing tools, much like to Google Docs, and the color scheme also seems familiar. When it comes to sharing, you can share the document with others over a link or even embed the document in an online blog or article, which is an option not available in Google Docs or other substitutes for it. Apart from the ability to collaborate, you can also chat with other participants. Furthermore, CryptPad gets its name from its ability to encrypt documents, which ensures that your documents are completely safe from intellectual property theft, and these documents are only accessible using the encryption keys. Unlike Google Docs, you’ll have to pay to get the most out of CryptPad. While free users get up top 50MB of storage on the cloud, you can buy a subscription starting at 5 euros (~$6). When you sign up you also get access to CryptDrive – an online file-sharing service along with CryptPad. Lastly, another great feature of the app is that you can simply sign in with a username and password, without the need of entering an email ID. Alternatively, you can use Airborn (visit) for collaboration if you want a tool with AES 256 encryption but the tool is mostly limited to word documents. It has flexible paid plans and it charges you $3.5 per month to enable sharing. 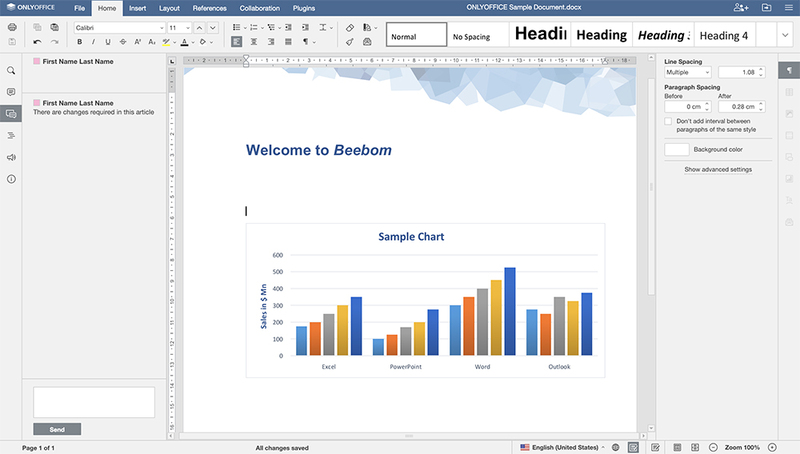 Collabora is an online collaboration and editing suite based on LibreOffice for information-rich documents. The online application brings an elaborate set of editing tools using the familiar MS Office-style layout. Besides a full-fledged editing toolbar, you also get the ability to add comments whether it’s for the team to emphasize on an edit or for you to clarify your doubt. Compared to Google Docs in which you can only resolve comments, the flow of comments in Collabora feels more user-friendly and you can reply to each comment individually, mark it resolved, or delete it. However, Google gives you the liberty to share the comment with a link, which is not available in Collabora. Collabora is available in both server-based and cloud-based options and for the cloud version, you get support from reliable services such as NextCloud, ownCloud, and Pydio. Out of the three, you’re free to choose any depending upon which service provides the least latency of the three for you. The pricing for cloud-based Collabora starts at $18 per user per year, but you can start by taking a free demo. However, you cannot use the service without an internet connection. The cloud services are most useful for clients in the US and the EU, and customers outside these regions might face some lag while using Collabora. Furthermore, you’ll have to adjust with the somewhat outdated interface, but the extensive sharing options would make you forgive the lack of features. Graphite Docs is a blockchain-based text editor which you can use to invite collaborators. The editor is fairly simple to use and comes with a minimal user interface with direct controls and interactive design elements. Despite the lightweight interface, you get all the useful editing options except for the number of fonts which is limited to three in the free version of Graphite Docs. Being based on the blockchain, Graphite Docs uses BlockStack to sign in. Apart from the text editor, there is a file vault i.e. a blockchain-backed storage drive where you can store a variety of documents protected with encrypted keys. This provides added security over Google Docs and other Drive applications. You can either share the documents and files with other users via public links or with saved contacts that are also using Graphite’s services. Besides documents, you can also access basic sheets and while there aren’t a lot of options, the ease of assigning basic arithmetic functions to the cells is pretty great here. Along with all of that, your usage stats are visible through a central dashboard, which can definitely come in handy, and you even get the ability to connect Graphite with popular apps like Medium and Slack. 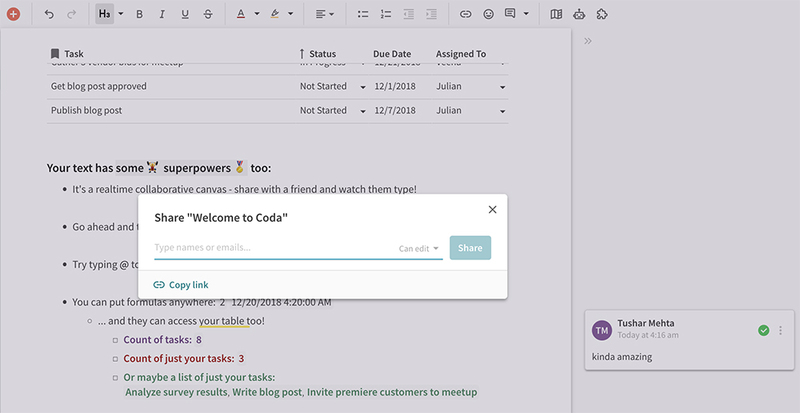 Much like Quip, Coda is more of a collaborative team planning tool than just a text editor. To begin with, you can add multiple elements in form of modular elements like graphs, table, videos etc. within a single document. The idea is to accommodate any idea that pops up in your brain, irrespective of when or how it comes up. To make your job easier, Coda allows you to initiate a new task or tag a team member by simply typing ‘@’. The editing toolbar on the top has a mix of commonly used editing tools which will remind you of a common CMS editor like WordPress. There aren’t a lot of font styles or sizes to play with but that’s not the main utility here. Notably, there are fewer editing options compared to Google Docs, especially because the focus of the app is collaboration and not simply editing. The purpose of this software is to let users be more productive and synchronous with their team, especially if you’re part of a team working remotely. Besides these editing features, you can also add comments or automate tasks from within Coda in an IFTTT format. Furthermore, there’s a huge catalog of templates which you can utilize to get your job done quickly. Bit.AI is a tool designed for higher team productivity and collaboration rather than simply keeping documents. To begin with, you get a broad catalog of templates that you can choose from but you can also create a fresh document if you prefer a custom layout. When it comes to editing, you get a limited number of tools. Instead of an editing toolbar resting on the top, there’s a floating bar and these options are mostly relevant for HTML content intended for the internet instead of formal or legal documents. However, Bit.AI takes the lead compared to Google Docs when it comes to the flexibility of options related to sharing. On the dashboard, admins can manage or control all of the activities of the users invited to collaborate. Users can create multiple workspaces and link them to different objectives or assign them to different teams. Besides individually auditing and controlling access to each of the workspaces, the admins can also track each link which has been shared by their teams and check the activity on each document corresponding to the link. The fact the Bit.AI has a large database of video lessons, mostly related to how the interface works, makes it more user-friendly. It is similar to Coda, but there are more options here to collaborate and segregate documents cleanly making it one of the best Google Docs alternative, in my opinion, if you want to focus on utility more than the number of editing options. 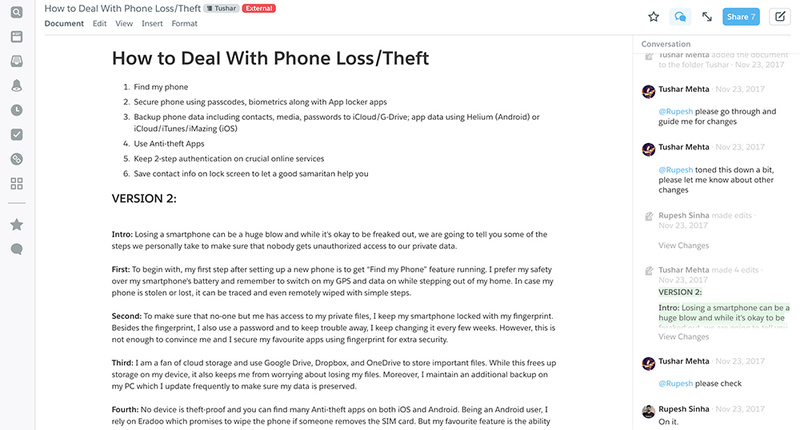 If you think 1GB of storage is sufficient for your usage, you can use Bit.AI for free, but for better control, added features, and unlimited link tracking, you can buy the paid version for $12 per user per month. Whether you’re trying out of concerns of privacy after the massive Google Docs breach earlier this year or just out of curiosity, we’re sure these Google Docs alternatives will help you maximize productivity. With tools like Office Online, you can have the same workflow as Microsoft Office Suite while apps like Coda and Bit.AI will allow you to concentrate the synergy of the entire workforce and allow you to focus on finding or creating solutions instead of being anxious over problems. Meanwhile, if you’re familiar with LibreOffice, Collabora will be most suitable for you. Lastly, if you fashion a simple interface, either Graphite Docs or Dropbox Paper will be the most suitable tools for your trade, especially if you want these applications for personal use.